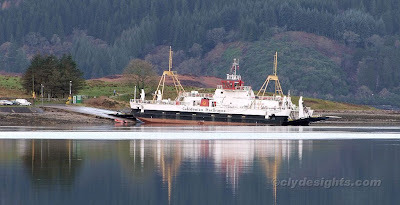 One the Service Information page of her owner's website, Caledonian MacBrayne advised on Wednesday morning that their Colintraive-Rhubodach service was: "suspended until further notice" due to "technical reasons". The incumbent ferry on the route, LOCH DUNVEGAN, had in fact become stuck on the Rhubodach slipway on a falling tide, as is apparent in this view taken around three hours later. She was refloated as the tide rose again, and returned to service later in the day, apparently undamaged.